March 1st through 31st, 2019, you will have a special, one-time open enrollment opportunity for optional long-term disability insurance. You can enroll or reduce your waiting period without providing evidence of insurability (proof of good health). If you haven’t enrolled in optional LTD in the past, or didn’t want to provide proof of good health, now is a great time to reconsider this benefit. Though employees can enroll in or change their optional LTD insurance at any time, normally they must provide evidence of insurability (proof of good health) – which includes authorizing their health practitioner to release their medical records to the plan provider, Standard Insurance – if they are enrolling after their original 31-day enrollment window. This opportunity is available to every PEBB benefits eligible employee, including those who have been previously denied optional LTD insurance coverage. Complete the LTD One-Time Open Enrollment/Change Form and return it to the Benefits Office (318 SHW) between March 1st – 31st, 2019. The form will also be available in the Benefits Office and on the Benefits website under the section Long-Term Disability coverage. Changes made during this one-time open enrollment will be effective May 1, 2019. For questions contact the Benefits Office at 509.359.2488 or by email at benefits@ewu.edu. Employees who will be on PEBB Continuation Coverage (Unpaid Leave) in March 2019 should contact the PEBB Program at 1-800-200-1004 for more information. During the first 31 days of eligibility and during the annual open enrollment, employees may choose among the following medical plans. Classic, CDHP, Medicare Advantage, Original Medicare, or Value. A CDHP is a high-deductible health plan (HDHP), with a health savings account (HSA). CDHPs offer lower premiums, a higher medical deductible, and a higher medical out-of-pocket limit than most traditional health plans. If you cover yourself and one or more family members, you must pay the entire family medical deductible before the CDHP begins paying benefits. Your prescription-drug costs count toward the annual medical deductible and out-of-pocket maximum. Preventive care services are covered at 100 percent with no medical deductible. See benefits and coverage by plan for CDHP coverage details. An HSA is a tax-exempt account anyone can deposit funds into on your behalf. You can deduct any amount you contribute from your taxable income, giving you a tax savings. You can use your HSA to pay for IRS qualified out-of-pocket medical expenses (like deductibles, copays, and coinsurance), including some expenses and services that your health plans may not cover. You can spend HSA funds on qualified expenses for your spouse or other tax dependents, even if they aren't covered on your plan. In addition, your HSA balance can grow over the years, earn interest, and build savings that you can use to pay for health care as needed and/or pay for Medicare Part B premiums. The PEBB Program offers consumer-directed health plans (CDHPs) with health savings accounts (HSAs) to eligible members through Kaiser Permanente WA (formerly Group Health, Kaiser Permanente NW*, and Uniform Medical Plan. When you enroll in a CDHP, you are automatically enrolled in an HSA. The plans' HSA trustee is HealthEquity, Inc.
*Kaiser Foundation Health Plan of the Northwest, with plans offered in Clark and Cowlitz counties in WA, and the Portland, OR area. You must meet certain eligibility requirements to enroll in a CDHP/HSA. If you (the subscriber) are not eligible for a CDHP/HSA and enroll, you may be liable for tax penalties. You are enrolled in Medicare Part A or Part B or Medicaid (called Apple Health in Washington). You are enrolled in another comprehensive medical plan—for example, on a spouse’s or state-registered domestic partner’s plan. You or your spouse or state-registered domestic partner is enrolled in a Voluntary Employees’ Beneficiary Association Medical Expense Plan (VEBA MEP) account, unless you convert it to limited HRA coverage. You enrolled in a Medical Flexible Spending Arrangement (FSA) or Health Reimbursement Arrangement (HRA). This also applies if your spouse has a Medical FSA, even if you are not covering your spouse on your CDHP. This does not apply if the Medical FSA or HRA is a limited purpose account, or for a post deductible Medical FSA. You are claimed as a dependent on someone else’s tax return. Other exclusions apply. Check IRS Publication 969—Health Savings Accounts and Other Tax-Favored Health Plans at www.irs.gov, contact your tax advisor, or call HealthEquity toll-free at 1-877-873-8823 to verify whether you qualify. See The Complete HSA Guidebook for full details. The Medical FSA allows you to set aside pre-tax money from your paycheck to pay for out-of-pocket health care costs. FSA participation is only valid for the plan year in which you enroll and does not continue automatically. You must enroll or re-enroll each year during the PEBB Program's annual open enrollment period. You can contribute a minimum annual amount of $240, up to a maximum annual amount of $2,500. The DCAP allows you to set aside money from your paycheck on a pre-tax basis to help pay for qualifying child care or elder care expenses while you (and your spouse or state-registered domestic partner) attend school full-time, work, or look for work. Age 12 or younger and live with you. Age 13 or older, physically or mentally incapable of self-care, and regularly spend at least eight hours each day in your household. $5,000 annually for a single person or married couple filing a joint income tax return. To enroll or re-enroll visit Navia Benefits Solutions. Re-enrollment for the next plan year happens during November's Open Enrollment each year, you can re-enroll online with Navia or return the Navia Enrollment Form to the benefits office SHW 318 before Nov. 30th. When you incur an eligible expense, you can submit a claim online, use the mobile app, or send a claim form by fax, mail, or email to request reimbursement. You also can sign up for a debit card. You must submit all claims for reimbursement to Navia Benefit Solutions no later than March 31 after the end of the plan year. After that date, your account will be closed and any balance remaining will be forfeited to the Health Care Authority. Once the money is forfeited, you will not be able to claim it. This is referred to as the "use-it or lose-it" rule. Managed care plans may require you to select a primary care provider (PCP) within its network to fulfill or coordinate all of your health needs. The plan may not pay benefits if you see a non-contracted provider. PPO’s allow you to self-refer to any approved provider type in most cases, but usually provide a higher level of coverage if the provider contracts with the plan. CDHPs let you use a health savings account (HSA) to help pay for out-of-pocket medical expenses tax free, have a lower monthly premium than most other plans, and a higher deductible and a higher out-of-pocket limit. See Health plans with health savings accounts (HSAs). You may choose from the plans listed below. Your options are limited to the plans available in your county. Remember, if you cover eligible dependents, everyone must enroll in the same medical plan. Visit the PEBB plan sites for more information: Kaiser Permanente WA (formerly Group Health) plans, or Uniform Medical Plan (UMP) plans. To add or remove a dependent from your health insurance, you must complete a new Employee Enrollment Change Form and return it to the Benefits Office. Be sure to complete the form in its entirety - this will replace all previous forms. Usually this must be done within 30 days of the qualifying event. The certificates of coverage (COCs), also called benefits booklets, are produced by the health plans to provide detailed information about plan benefits and what is and is not covered. All medical plans require you to pay an annual deductible before the plan pays for covered services. UMP Classic also has a separate annual deductible for some prescription drugs. Preventive care and certain other services are exempt from the medical plans’ deductibles. This means you do not have to pay your deductible before the plan pays for the service. Some plans require you to pay a fixed amount, called a copay. Other plans require you to pay a percentage of an allowed fee (called a coinsurance) when you receive care. Monthly premiums and applicable surcharges. Charges above what the plan pays for a benefit. Charges above the plan’s allowed amount paid to a provider. Charges for services or treatments the plan doesn’t cover. Prescription-drug deductible and prescription-drug coinsurance (UMP Classic only). You must submit the Employee Enrollment/Change form to the benefits office during the annual open enrollment or when a special open enrollment event occurs, within the PEBB Program’s timelines. The benefits office must receive the Employee Enrollment/Change form between November 1-30. You may also make some changes using My Account. 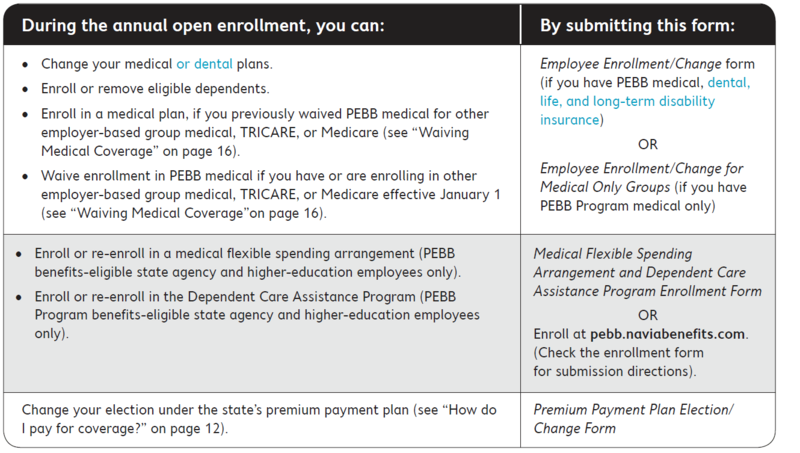 See the chart of changes you can make during the annual open enrollment. Events that create a special enrollment include. The benefits office must receive the Employee Enrollment/Change form no later than 60 days after the event that created the special open enrollment. You can make some changes during the year without a special open enrollment event. Change your name and/or address. Use the Employee Enrollment/Change form. Remove dependent(s) from coverage due to loss of eligibility (required). Your personnel, payroll, or benefits office must receive a complete Employee Enrollment/Change form no later than 60 days after the event. Start, stop, or change your contribution to your health savings account (HSA). Use the Employee Authorization for Payroll Deduction to Health Savings Account form. Change your HSA beneficiary information. Use the Health Savings Account Beneficiary Designation form. During the first 31 days of eligibility and during the annual open enrollment, employees may choose among two managed care dental plans and one fee-for-service plan, the Uniform Dental Plan. DeltaCare and Willamette Dental Group are managed-care plans. You must choose a primary dental provider within their networks. Uniform Dental (UDP) is a preferred provider plan. Visit the plan sites for more information: DeltaCare, Willamette Dental Group, or Uniform Dental Plan. Managed care dental plans require that you use their facilities and/or dentists for all of your services. By doing this, they control their costs, and you pay less for services. Fees are usually a flat co-payment as listed in the plan book. The Uniform Dental Plan (group#3000) is a fee-for-service plan with a preferred provider network option. You may use any dentist you wish. If you use a preferred-provider, your dentist will bill within the rate schedule, and you will only pay the employee share. This plan is managed by Washington Dental Service, the claims administrator for the plan. Compare the dental plans and benefits here. Administered by Delta Dental of Washington (managed-care plan). Administered by Delta Dental of Washington (preferred-provider plan). EWU provides basic life insurance to all employees eligible for full benefits. During the first 31 days of eligibility employees can enroll in optional and AD&D life insurance. Phone: 1-866-548-7139, benefits specialists available Monday through Friday, 5 a.m. to 8 p.m.
> How Much Do I Need and What Will it Cost? $35,000 for death from any cause. An additional $5,000 in case of accidental death or dismemberment. As an employee, your basic life insurance covers you and pays your designated beneficiaries in the event of your death. Your basic life insurance includes accidental death and dismemberment (AD&D) insurance, which provides extra benefits for certain injuries or death resulting from a covered accident. Employees may enroll in optional term life insurance in increments of $10,000 up to $500,000 guaranteed issue*, up to a maximum of $1,000,000 with Medical Evidence of Insurability. Increments of $5,000 up to $100,000 guaranteed issue*, up to a maximum of $500,000 with Medical Evidence of Insurability. Coverage cannot exceed 50% of employee's optional life insurance. Increments of $5,000 up to $20,000 (Ages: 14 days up to 26 years). *Guaranteed issue is the amount of coverage an employee may select when initially eligible for coverage, within the required deadlines below, without submitting a statement of health for carrier approval. Optional AD&D Insurance never requires evidence of insurability, and you can apply at any time. Employees may enroll on AD&D insurance in ncrements of $10,000 up to $250,000. Optional AD&D insurance does not cover death and dismemberment from non-accidental causes. costs of staying in your home. child care costs, elder care costs, and/or college expenses. SSDP currently working at home. costs of assisting a disabled family member. Find out the monthly cost for optional life and accidental death and dismemberment (AD&D) insurance here. You may enroll within 31 days of becoming eligible for PEBB benefits. You can complete a MetLife Enrollment/Change Form or create an account on MetLife’s MyBenefits portal. In the Account Sign in box type "PEBB Benefits - State of Washington"
This will take you to a Welcome to MyBenefits screen where you can log into your account. First Time User? Click the Register Now! button. After registering for an accunt you will receive a thank you email from MetLife that includes a link back to the MyBenefits page. If you have questions about the MetLife website, please contact MetLife at 1-866-548-7139. You can complete a MetLife Beneficiary Designation or log in to your MyBenefits portal and modify beneficiaries. To sign in use Account Sign In: PEBB Benefits - State of Washington. Forms are also available in the Benefits Office. Your coverage's will remain the same when updating beneficiaries. For questions contact the Benefits Office. Employees who will be on PEBB Continuation Coverage (Unpaid Leave) in March 2019 should contact the PEBB Program at 1-800-200-1004 for more information. EWU provides basic long-term disability (LTD) insurance to employees eligible for full benefits. During the first 31 days of eligibility employees can enroll in additional optional LTD insurance. Long-term disability (LTD) insurance is designed to help protect you from the financial risk of lost earnings due to serious injury or illness. When you enroll in LTD coverage, it pays a percentage of your monthly earnings to you if you become disabled. What is considered a disability? Being unable to perform with reasonable continuity the duties of your Own Occupation as a result of sickness, injury, or pregnancy during the benefit waiting period and the first 24 months for which LTD benefits are payable. Benefit: 60 percent of the first $400 of your predisability earnings (your monthly base pay), reduced by any deductible income. Benefits start after 90 days or the period of sick leave (excluding shared leave) for which you are eligible under the employer’s sick leave plan (whichever is longer), and continue during disability up to the maximum benefit period. Benefit: 60 percent of the first $10,000 of your predisability earnings, reduced by any deductible income, and any benefits paid under the basic plan. Benefits start after the end of the benefit waiting period you choose, or the period of sick leave (excluding shared leave) for which you are eligible under the employer’s sick leave plan (whichever is longer), and continue during disability up to the maximum benefit period. The maximum benefit period is based on the age of the enrollee when he or she becomes disabled. Requests to enroll after the first 31 days of employment require insurance company approval. Any prior medical problems (e.g., back pain, knee pain, diabetes, cancer, etc.) may result in a denial of coverage. Premiums are based on a percentage of your monthly salary. The rates vary with the length of your Waiting Period, and on your retirement plan eligibility. See premiums costs here. The LTD Booklet is available at the link or you may request a copy from the Benefits Office at 359-2488. To terminate your optional LTD coverage, you will need to complete a new LTD Enrollment/Change Form. You may visit or call the Benefits Office to get this form. To increase or decrease your waiting days any time after the first 31 days of employment you will need to complete a new Enrollment/Change Form. To decrease the waiting days you will also need to complete the Evidence of Insurability Form. The University will provide eligible probationary, tenured, and senior lecturers with long-term disability insurance, with a 120-day waiting period. Eligibility shall be determined by the rules applicable to the long-term disability insurance plan. Faculty members who elect an optional LTD benefit waiting period of less than 120 days shall be responsible for paying the additional costs associated with their plan choice. Contact the Benefits Office for the faculty LTD form. As an employee on Leave without Pay, you are entitled to PEBB continuation coverage (LWOP coverage). Employees may continue medical and dental benefits, life insurance, and in some cases, long-term disability insurance. You must enroll in continuation coverage to enroll your eligible dependents. > What Insurances May I Continue via Self-pay? > How Long May I Continue Insurance on Self-Pay? > Do I have to Self-Pay for All My Insurances? > What Happens If I Don't Self-Pay? You are eligible to self-pay your medical, dental & life insurance, and in some cases long term disability (LTD) if you are on approved leave from an otherwise eligible position. LTD - if you are on an approved educational leave. While on an approved leave of absence, but in no case longer than 29 months. During the period of layoff or re-employment rights as defined by the personnel rules or labor contract covering your position. If there are no re-employment rights for your position (i.e. faculty and professional staff) but your employment ended due to lack of work or lack of funds, then you will have up to 24 months of self-pay layoff status. If a leave is fully or partially covered by the Family and Medical Leave Act (FMLA), some coverage's may not require self-pay. Faculty may contact Academic Personnel and Classified Staff may contact Human Resources. Contact the Benefits Office for information about how your personal benefits will be impacted by FMLA. No. You may choose which if any of the coverages you wish to self-pay. However if you do not self-pay, the life and LTD insurances may not be automatically reinstated on your return to the payroll, and may require proof of good health. LTD cannot be self-paid unless you are on an approved educational leave. Employees re-hired from layoff who did not self-pay may not choose a new plan or add new dependents. Exception: if an open enrollment has occurred between the last period of coverage and the re-hire date, or a marriage, birth or an adoption has occurred. Life insurance ends as of the last day of the month in which the full monthly premium was paid; on return from leave or layoff, no optional coverage is reinstated unless applied for and approved by MetLife. LTD ends as of the last day in pay status and is reinstated on return as long as the enrollment form is completed within 10 days of return from leave; only those employees on an approved educational leave may continue LTD on a self-pay basis. If you allow your optional (employee-paid) life insurance and, if on approved education leave, your LTD insurance to lapse, you must re-apply for coverage on return and provide proof of good health to the insurance company. You pay your normal premiums plus the employer basic coverage premium. LTD can only be self-paid while on an approved educational leave of absence. Employees on other types of leave may not self-pay, but the optional coverage can be reinstated if you apply within 10 days of your return to an eligible position. If an educational leave is partially paid, deductions will be taken from the partial salary. Benefits, in the event of a claim, would be based on the partial salary unless arrangements are made to pay the difference and continue premiums as though in regular appointment pay status. Contact the Benefits Office for more information and to arrange deductions. Enrollment and benefit information specific to COBRA coverage for subscribers and their dependents is available here. > What Coverage May I Continue? The Consolidated Omnibus Budget Reconciliation Act (COBRA) is a federal law that gives you and your covered dependents the right to continue group health coverage on a self-paid basis if eligibility for the employer-sponsored group medical and dental is lost. your hours of employment at the EWU are reduced to the extent that eligibility for employer-sponsored medical and dental benefits would ordinarily be lost. to a child of a EWU employee who loses eligibility for dependent coverage due to age or loss of dependent status. you were dismissed for gross misconduct. You may continue medical and dental coverage together or either coverage separately. You and each of your enrolled family members are entitled to make a separate decision to continue coverage. HCA will send you a Notice of qualifying event packet when EWU reports your separation to them. Send the form and payment to the state Health Care Authority at the address enclosed in enrollment packet no later than 60 days after the date your employer-sponsored coverage ends . Premiums must be paid retroactive to the first day of the month following the qualifying event. Click here to see current COBRA rates. Visit HealthCare.gov for additional information. > How Does the Affordable Care Act Affect Me at Eastern Washington University? With coverage being available under the Affordable Care Act (ACA), beginning January 2014, most individuals will be required to have health insurance coverage. Benefits offered to benefit-eligible Eastern Washington University (EWU) faculty and staff, have been determined to meet and/or exceed the standard identified by the ACA including premium affordability and acceptable health coverage levels of coverage. The regular student plan may also be a viable option. However, employees and students currently not eligible for or covered by benefits through EWU may need/want to review the coverage options available through the Marketplace, a new way to buy health insurance under the ACA. This webpage provides basic information about the Marketplace as well as benefits offered through EWU, and its intended to assist in evaluating options for you and your family. This notice specifically addresses the requirements of the ACA Employer Notification, but will also provide links to additional inofrmation individuals and their families may find helpful. This notice serves as a household employer notification and should be provided to household members as well. This notice has been provided to all existing employees as of September, 2013 and will be provided to all future employees starting October 1, 2013.